Autumn abounds; sepia tendrills creep through trees and hedgerows. The dichroic blur of a dragonfly glances across river surface as I fill the basket with damsons, wild carrot heads twisting themselves into forlorn curls along the muddy track. The countryside is contemplating the onset of winter. Serves 4. 1 Gently soften the ginger, onion and orange zest in a small pan while you de-stone the damsons. Stir in the fruit, sugar, star anise, orange juice and vinegar, then cook for a further 10 minutes (if your damsons are a touch astringent you may have to add a little extra sugar along the way). Leave to cool. 2 Spoon 3 tablespoons of five spice onto a large plate, then add salt and pepper. Roll each breast in the powder, then put to one side. 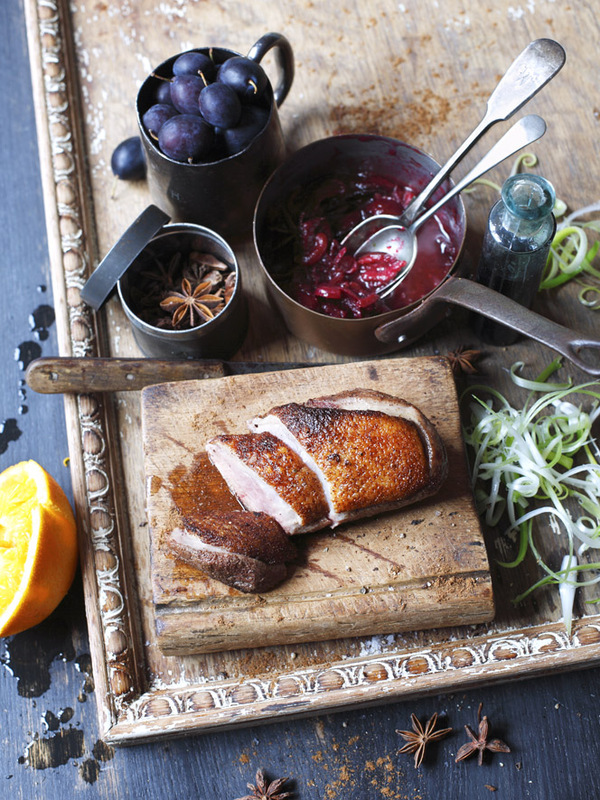 If you like your duck skin extra crispy, score a criss-cross pattern into the skin with a sharp knife before seasoning. 3 Fry the duck breasts skin side down for 7-10 minutes until the skin is crispy. Turn the breasts over and cook for a further 5-7 minutes. Rest (the duck breasts - not you), slice, then serve in warm tortillas with spring onions and a good dollop of the relish. Ooh, like a pimped up duck pancake - NICE. Damson relish sounds like a nice swap for hoisin sauce. I could eat that right now.